Are you a sewing enthusiast or someone who casually enjoys it? Are you yourself looking to upgrade your sewing equipment or know someone who could use an upgrade? Nonetheless, it’s no child’s play to buy a good serger. From being unable to choose one out of so many options, it’s also harder to buy one suitable for you. In a few moments, you’re going to be introduced to a serger that will most likely win your heart. 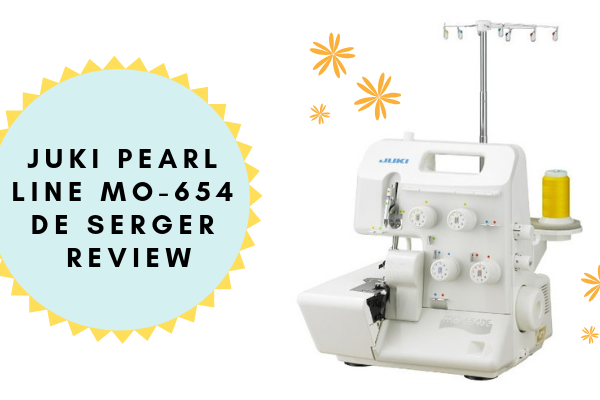 Yes, we’re talking about the JUKI Pearl line MO-654 DE serger. Intrigued? Read further to find more about it! 8 Where To Find Yours? The entire body is a beautiful tone of white which looks classy and wouldn’t clash with the room’s aesthetic. The white color gives it a professional and polished look and makes it a great addition to your sewing equipment. The machine weighs about 25.4 pounds. It is lightweight and can be traveled with. You can also easily move it from room to room if required, give it as a gift or take classes with it. It’s not heavy or bulky, and therefore it is not a problem to store either. 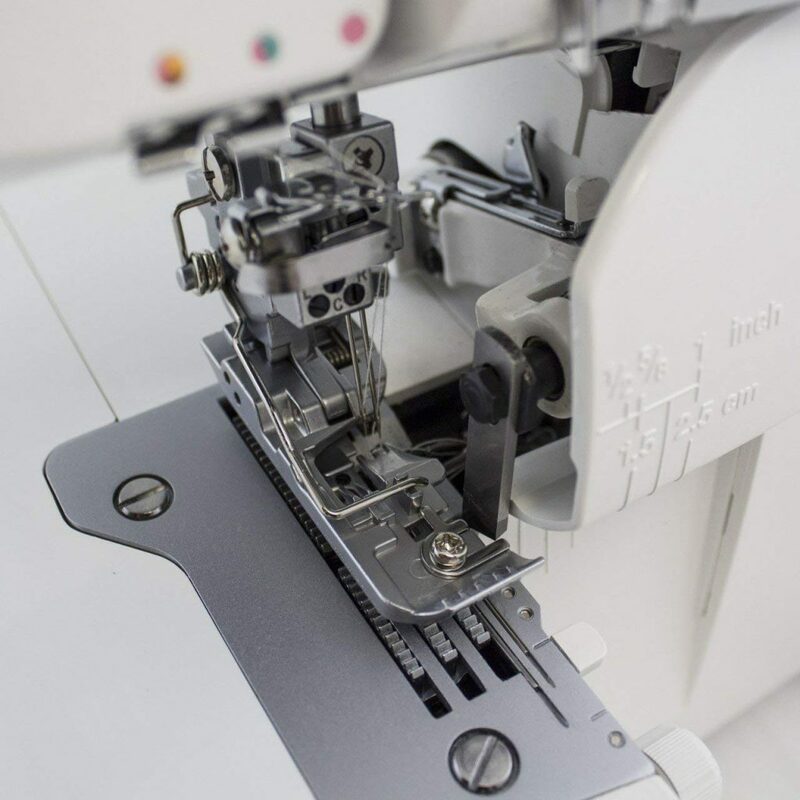 The very design of this serger is such that it is easy to use for beginners. When you’re just starting out with sewing, a lot of things might overwhelm you like threading the machine. However, with this machine, it’s not something you need to worry about though. It comes with a color-coded threading system which enables you to thread easily and efficiently. The time effective threading makes you enjoy the entire sewing experience more. Furthermore, the design features a well-lit workspace which allows a better visual for you while working on projects. This machine comes with a comprehensive manual and an instructional manual which makes learning the workings of it easy. It constitutes of many hints, tips, and ideas to create fabulous projects from the luxury of your home. Even with its easy to use design JUKI hasn’t excluded its more professional audience and has made this machine accessible to people of every skill level. With an array of features, this masterpiece by JUKI has earned its respect in the eyes of professional sewers too. Want to find out more about it? Then keep on reading! Here are the accessories accompanying the machine. JUKI is an internationally renowned company. It is headquartered in Tama-shi, Tokyo and is a Japan-based brand. They are well acclaimed and acknowledged globally for the production of industrial strength sewing machines. However, they have recently taken a leap in manufacturing domestic sewing machines. Their company motto is “Mind and Technology.” The brand is worldwide trusted to create high performance and high quality machines. Their signature machine designs give you all the creative freedom to experiment and learn. Furthermore, they create machines for individuals at every skill level. The machines they make are not limited to just skilled professionals but the whole spectrum of people out there. The JUKI offers a five-year limited warranty on the JUKI Pearl line MO-654 DE which differs according to the different parts of the machine. The warranty of the product becomes applicable from the date of purchase till the above mentioned time period. JUKI promises its products to be free from any defect in craftsmanship. However, the included accessories namely the Needles, loopers, knife blade, Bulbs, lamps, and Belts aren’t included in warranted items. JUKI does not warrant your product from damage caused by using parts other than those provided by JUKI itself. Furthermore, it is absolutely necessary to learn the workings of this machine pre-handling it. You will also be provided with a form for JUKI warranty which is required to be filled and submitted. This form makes you legible for the warranty which is otherwise void. It’s also suggested to keep the original packaging of the product in case of having it repaired. Most importantly, the warranty isn’t transferrable to a subsequent owner. Finally, let’s look at some of the features offered in detail! This machine comes with a thread capacity of 2, 3 or 4 threads which is incredible. The option of having these many configurations makes it easy to work on different fabrics. You can work on a wide variety of fabrics which gives you creative freedom. You can use the 2 thread configuration for lighter fabrics whereas the 3 and 4 one for more thick fabric. A common complaint made by people starting out with sewing is that they find it hard to thread the machine. It may have been even putting you off from sewing for quite some time. However, JUKI has solved the problem with this excellent design. The machine comes with a completely color-coded and clearly marked threading system. This basically takes all the guesswork out of threading and essentially des it for you. This makes threading particularly easier for beginners. 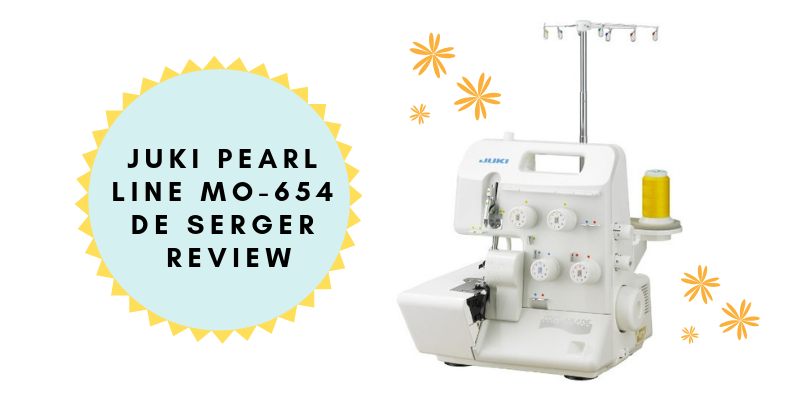 If you are someone who’s looking for a fast and efficient serger, then this is the one for you! 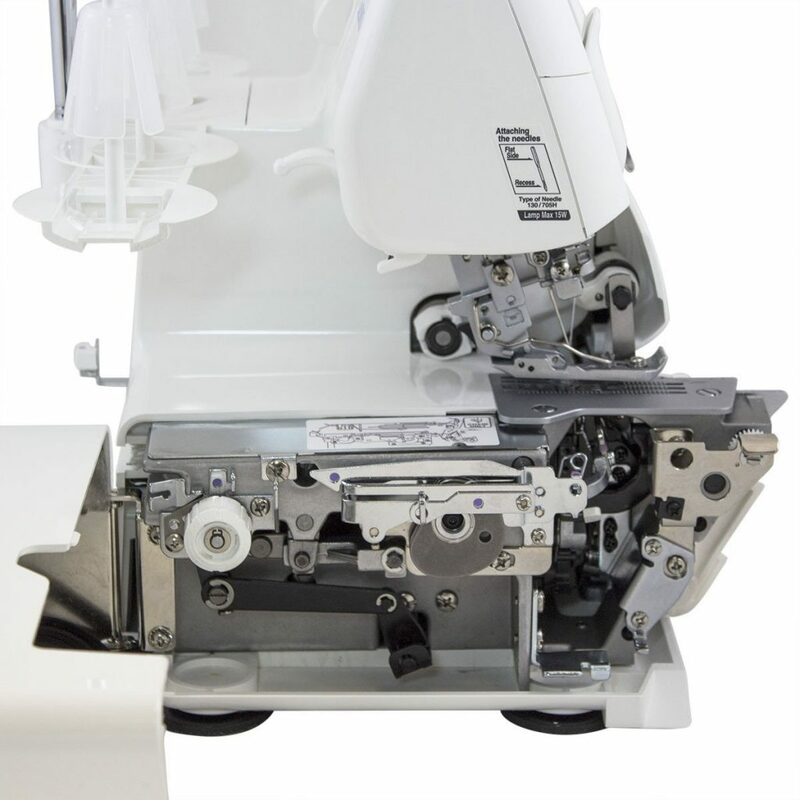 This serger offers a stitching speed of 1500 stitches per minute. This speed is nearly impossible to beat in this price range. A faster stitching speed makes it easier and less time consuming to work on larger projects. Therefore, with this machine, you’ll be able to achieve your goals faster. This feature particularly makes it a versatile machine appreciated by professionals as well. This feature enables you to add more complex over-lock stitches. You can also add decorative items like sequins, ribbons, tape, etc. with its aid. The snap-on presser foot helps you to shift multi-purpose presser feet easily. 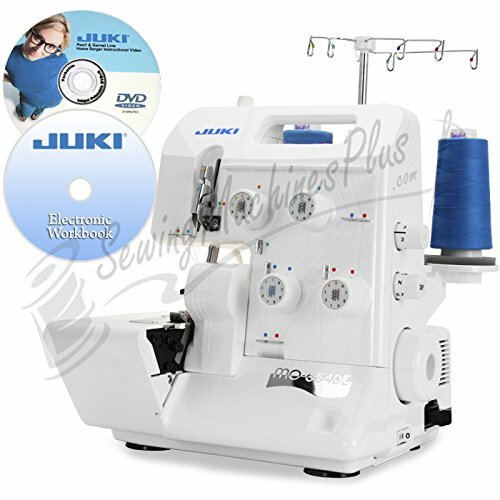 This element of this machine will help you enhance your sewing skills a lot. If you fear sewing because of its technicality or fear of messing up, then worry no more! This feature by JUKI basically takes all the guesswork out of seam allowances. There is a conveniently laced gauge which acts as a guide while serging. This way you can easily get the seams right without worrying about the allowances. 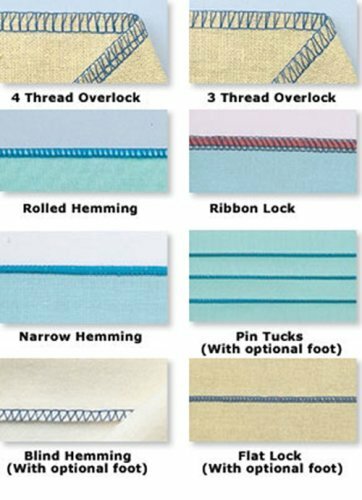 If you worry about keeping your thread in place while serging then worry no more. 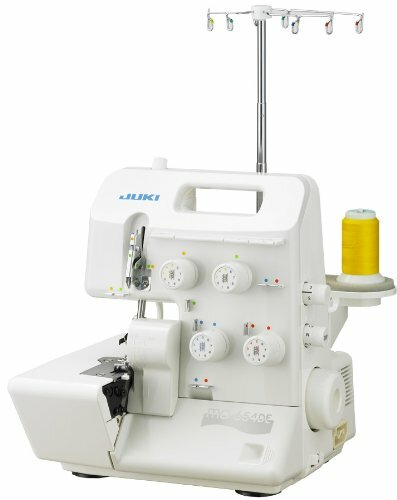 This machine is equipped with a 1- rotation thread tension dial which keeps the thread in place. This ensures proper sewing tension at every speed. 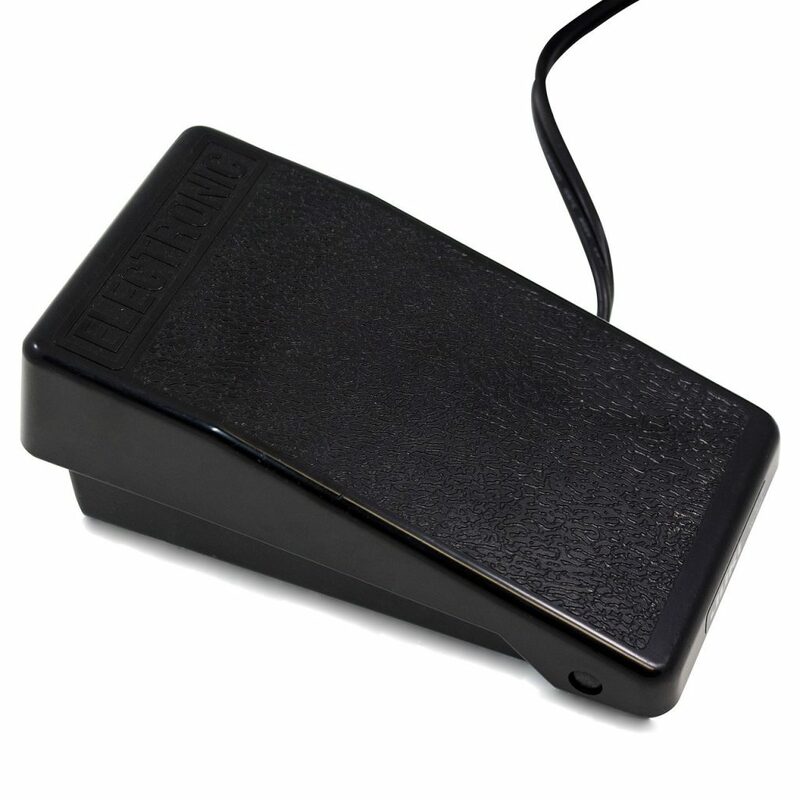 Within seconds you can disengage the looper for easier looper threading. Furthermore, there is a conveniently located dial which helps you adjust stitch lengths. It is just that easy by the turn of a dial! Same goes for adjusting the lower knife which can be easily adjusted with the turn of a dial. It is previously mentioned that this machine offers versatility in terms of fabric options. This is further ensured by this feature. The fact that this machine features sharp knives ensures easy cutting through both thinner and thicker fabrics. This allows you the creative freedom to be able to work with a lot of different kind of fabrics. This machine is accompanied by a very comprehensive and user-friendly manual. It is absolutely necessary for people just starting out with serging or sewing to know how their equipment works first. Before you go about making amazing projects on this machine get to know your equipment better. This user manual provides all the essential info whereas the DVD shows you all of it in action. The better you know your machine, the more comfortably you’ll be able to work with it. Furthermore, you can also avoid damaging the machine this way. The point of having this feature is to prevent your fabric from gathering or stretching at any length. Hence, needless to say, it is a very important feature in a serger. This is one of the best features this machine has to offer. JUKI offers a differential ratio of 0.7mm to 2.0mm. Still torn between whether or not you want to buy this? Let’s compare the pros and cons to give you a better idea. You can buy authorized machinery from Amazon or the JUKI website itself. This review was aimed at giving you a better idea of the product itself. Before, buying a serger, it is important to know what your requirement out of the product is. However, this particular product is quite suitable for people at every skill level. Therefore, it is a safe option to invest in. It is a complete return on investment and therefore has had received appreciation globally. Opinions may vary however with this design JUKI had outdone themselves once again. They have successfully paired basic serging features with more advanced ones.